Kids Sail FREE OR Third Adult Reduced Rate! Savings are in bloom at Paul Gauguin Cruises! Save HUGE with Kids sailing FREE on all cruises to Tahiti, French Polynesia, and the South Seas aboard the deluxe m/s Paul Gauguin. Or if your traveling with no kids the 3rd adult received INCREDIBLY reduced rates! And while you cruise, you’ll discover why readers voted Paul Gauguin the “#1 Midsize-Ship Ocean Cruise Line” in the Travel + Leisure World’s Best Awards 2017. Hurry! You must book FAST, to take advantage of this limited-time offer. ALSO, receive up to $400 onboard credit as a bonus from your friends at All-Travel! Call for NEW price on voyages! Special Promotion: 50% of Standard Cruise Fares. Special Promotion: Reserve This Cruise By Departure Date - Capacity Controlled, and Kids Sail FREE OR Third Adult Sails for Reduced Rate. Booking Window: Valid for new bookings made By Departure Date - Capacity Controlled. Applicable Sailings: ALL 2019/2020 m/s Gauguin sailings. Redemption Instructions: Contact Paul Gauguin Cruises at 800-848-6172 and book an applicable sailing. No promotion code or redemption form required. Confirmation: Promotion will automatically be applied at the time of booking. Combinability: Promotion is combinable with Signature Amenities, where applicable. Amenities only apply to first and second guest in stateroom. Promotion is not combinable with any other promotion. Terms and Conditions: Promotion is based on availability. Third Passengers 17 years of age and younger sail Free. Third Passengers 18 years of age and older sail for a reduced rate of $125 per night. 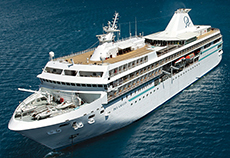 Promotion applies to any third passenger sailing in the same stateroom for any category that can accommodate a triple. Airfare is not included for third passengers. Third passenger is also responsible for taxes and fees. Promotion is subject to availability and subject to change without notice. Promotion is capacity controlled and may be withdrawn at any time. Promotion restrictions may apply.